Alteryx has opened a big data-analytics apps studio for people who do not necessarily have a deep knowledge of data science. 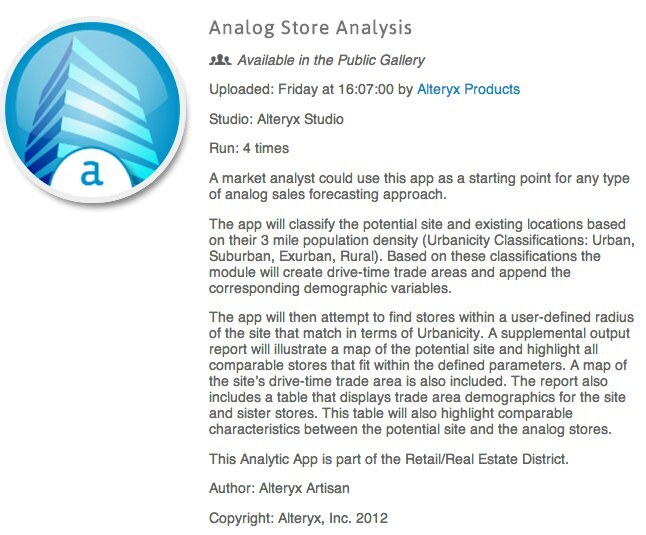 The service is available as part of Alteryx 8.0, the analytics provider’s latest release. The intent is to make data analytics as accessible as a consumer application makes its service. I tried playing with the apps. I used a Twitter tool to track tweets about Oracle. The results were relatively decent. A number of the apps in the studio are for the retail market, but there are also those that can be used for any business. For instance, there is a U.S. Census app for conducting demographic analysis. People may use the apps, collect and share data with colleagues — similar to the experience in a consumer app store. It also includes a desktop app builder. George Mathew, president and chief operating officer of Alteryx, said the intent is to create a service that is not just the domain of a small community of data scientists. More so, it’s for the 2.5 million data analysts in the market who can use the tools to drive big data analytics into any kind of an organization. Alteryx represents a trend with big data-service providers to take the information and expertise of data geeks and make it accessible through an app. For instance, Prior Knowledge, a TechCrunch Disrupt finalist, has developed a way for app developers to add a level of predictive analytics without the need to have deep knowledge of statistical analysis. The expertise is built into the Prior Knowledge technology. And on Friday, I featured Lytics, a service that tackles the problem that comes with getting value out of data from multiple sources such as mobile environments, the web, email, social, third-party APIs and commerce environments. Lytics customers use it to optimize pricing and inventory and multiple other aspects of the business that can draw from data to improve the queries and results.